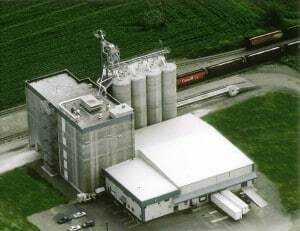 Chilliwack – In late 2015, Rogers Foods announced that they were expanding their operation on Simpson Road (44360 Simpson Road) with the construction of a new flour mill. The original mill site was built in 2005. Rogers Foods Ltd. hosted their grand opening event on Tuesday and brought in the big business guns. Among them was Mr. Takao Yamada from Tokyo, the President of Nisshin Flour Milling, Rogers Foods’ parent company. Rogers Foods has just completed adding 4,000 cwt/day of flour capacity at their Chilliwack facility, an 80% increase. This additional capacity will allow Rogers to continue serving its customers in the lower mainland of British Columbia as well as customers in the United States west coast and Pacific Rim. Rogers Foods also operates a mill in Armstrong, B.C., producing high quality flour and cereals that are shipped throughout North America and Pacific Rim countries. This announcement was always in the shadow of the announcement that Molson Coors would be constructing their new brewery in the Wack. This expansion is another major shot in the arm for the economy of the Eastern Fraser Valley let alone the area’s food processing industry. Be the first to comment on "Rogers Foods Unveils Chilliwack Expansion Project"